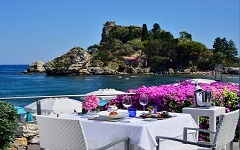 Wondering on how to join a luxury hotel, Taormina and a luxuriant nature surrounding you and your loved ones for an unforgettable holiday? La Plage Resort is the answer: few minutes away from the center of the town this charming hotel will give you the pleasant feeling of waking up in front of the stunning nature reserve of the Isola Bella. La Plage Resort is one of the creation of the Ragosta Hotels Group and gathers all you could possibly looking for whil booking a luxury hotel: Taormina, the historical world-know destination, its untouched and luxuriant nature and the privacy and fascinating comfort of 61 rooms right in front of the mediterranean sea. All the rooms of the La Plage Resort, the Ragosta's luxury hotel in Taormina, are equipped with the following comforts: heating and air conditioner, safe deposit box, Internet, fridge-bar, TV Plasma, satellite and pay TV, direct line telephone, room amenities designed by Expure SPA, room service and iPod dock.